I joined my first writing class this year and I survived! And I’m telling you, it is not easy. Get this: we were given five weeks to complete a young adult story based on a trope. The minimum word count is 5000, but I ended up with around 23k. So yes, it was partly my fault. I could have written a shorter story but the length wasn’t really the biggest challenge for me. It was finishing a (good) story with a satisfying ending in five weeks. Did I mention that I wrote The Boyfriend Backtrack, basically, for five years? It’s actually sort of a miracle that I finished What About Today (that’s the title of the new book, by the way). I used to have post-writing anxieties and even dream of alternate endings. But this one was pretty good to me and I think it was because I approached writing this story a little bit differently. 1. A clear deadline. When I was writing TBB, I’ve moved my deadline too many times. This time, I treated that deadline seriously. 2. Pegs. I didn’t have clear ‘pegs’ for TBB then. I used pegs for WAT because I was switching POVs. I didn’t want them to sound like the same person, so aside from photos I’ve learned to do this: I watch videos (mostly interviews) of my pegs. I try to do this before I return to writing to get that general feel of the character. I found this to be really helpful – not sure if this will work for everyone else, but it did for me. 3. A schedule. There are a couple of articles online that collated writers’ routines and rituals. As for me, I just pushed myself to write something every night (after dinner), even if it was only a couple of sentences/ paragraphs. It helped keep my momentum and stay in this story’s world. 4. An ending, before writing the ‘ending’. I wrote the ending in the middle of writing the story. I used to write in a ‘going with a flow’ manner, but having an ending earlier made completing the whole story easier for me. 5. A first draft to sort of scrap. I have been writing the first draft of this story for two and a half weeks before I completely started again. But the good thing about that is I already have the back story sorted out in my head. My first draft allowed me to get to know my characters better. When I wrote my second draft, there were less clutter. I finished the second draft in two days, too. I think some people solve this problem by outlining, and that’s probably smarter! Haha. But yeah, basically, my first draft is like freestyling; the second draft had the structure. I still got a lot of material from my first draft too! 6. A ‘team’. Beta readers are very important. I’m quite lucky to find friends who are happy to read and comment on my work. I’m happy that they are also quite different from each other: one is a reader and has that more ‘masa’ sensibility, the next one is quite the wildcard and the last one is my ultimate judge (in short, sya yung Head of the Board of Judges lol). Also, I found a cover designer (this is a relief cause covers stress me out haha!) who not only grasps the concept just by reading my synopsis, but also cares to read my stuff (phew!). 6. Also, that Ernest Hemingway quote (that apparently he didn’t say? Whaaat). I wasn’t drunk literally. 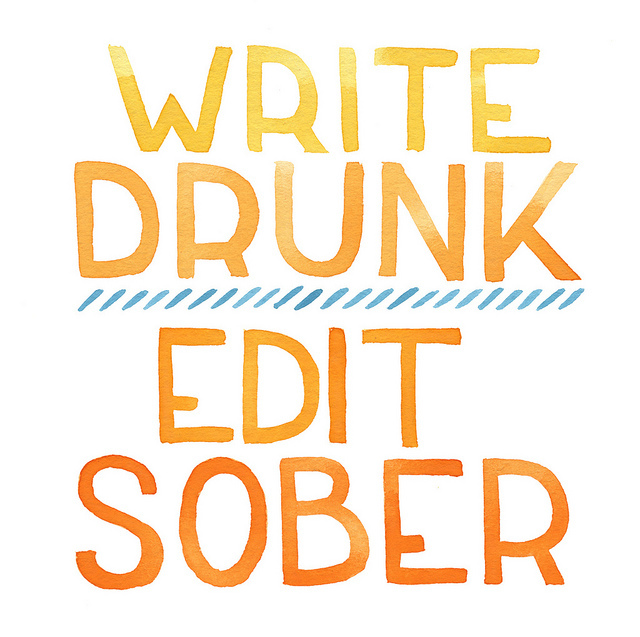 Figuratively, I was writing drunk (with word vomit hahaha). And then I stepped back to edit once I was ‘sober’. I’m so excited to share this new book, it will be out soon on Buqo. I’m also excited to read the rest of the stories from the class! You can read the whole class’ synopsis of their stories here.